Have you ever walked over sand? Then, have you noticed the footprints behind you? They are not just footprints. They are silent teachers. You have to be a good student for them to be your teacher. Don’t recall your mark sheets… I know they are best suited lying dead in that folder and locked in a locker. They don’t say a thing about how good student you are. Just try to listen and read the footprints. You’ll be proud being a good student. So what do they teach you? 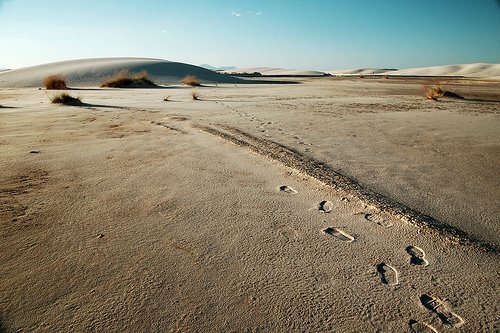 When you look behind you’ll notice that some footprints have faded. Those footprints is you, some moments back. That tells you, time will never let you be the same person. That’s why, You never meet the same person again. It becomes difficult to find yourself, what you were in your past. Add to it our memories, which too tend to fade with time. They teach us to find happiness in small things and that your low time will be over soon. Just as they fade as the time passes. Be careful and be true to your conscience as someone else may be stepping over your footprints and following the same path as you. You’ll never be alone all the time when you walk. There will be a stage where the path will be full of footprints. So much so that you won’t be able to clearly distinguish between them. You won’t be able to see your path. You are lost. This is the stage when you have to discover yourself and discover your path. Find a way out of these chaos. Create your own path. While you walk, there will be footprints which may act as a guide. Trust yourself. Trust your instincts. Walk with those footprints to find whether they are guiding you or misguiding you. But remember, A guide can only show you the path. He will never teach you how to walk. Throughout the journey, you’ll find few who will leave footprint on your heart (Don’t worry. They won’t be stepping on your heart). Never ever let these footprints fade away. Then, Even if you are walking alone, you won’t be alone. Yes very true.. looking at them you can learn a lot And yes those dear darling footprints that make way to you heart.. they are the best … like you say shud not let them fade up… Nice article .. Foot prints ..they usually scares me… !!! when I see them in snow…and its not mine I know.. but.. its a very good example given by u..
i am just thinking how to express my views about this nice post then it just came why not to campare this footprints with our experiences or u may may be actually talking about experiences i am not that much intellignt. You don’t have to be intelligent to understand the experiences. You have to be experienced to understand the experiences. You have kinda tweeked the message of the Footprints story and this your version of it! But its nice anyway, makes sense and defi a heartfelt..
left a footprint on the reader’s mind! need to be more active on the blog.. what do ya say? Yup. I am trying my best to be more active. To get more time I have stopped watching movies. Movies on weekend only now. Movies are prime source of my topics. nice post..that’s what is left just footprints..on the hearts and mind of the people we interact!! Superb Article Brother. it really lefts footprint on reader.